MONTGOMERY – Alabama Gov. Kay Ivey on Tuesday issued an op-ed entitled "An Alabama Solution to an Alabama Problem: Rebuilding the Alabama Corrections System." In it, she addressed the need for reform in the state's corrections system. In particular, she called for $31 million to hire 500 new correctional officers and increase the pay scale for all security personnel and the construction of three new regional men's prisons. Like many other states, issues of violence, poor living conditions and mental illness persist within our system. These issues, and others, are exacerbated by a crowded inmate population, correctional and health care staffing challenges, and aging prison infrastructure – each piece compounding the others. We have a problem in Alabama, and we have waited far too long to address it. The path forward to resolve these problems is clear and obvious. However, this path is neither quick nor simple. First, we must increase our correctional staffing levels by improving the pay scale for correctional officers and expanding our recruiting efforts. Second, we must construct prison facilities that meet the needs of a criminal justice system in the 21st century. We have already started making strides toward reducing our prison population and increasing staffing levels. In 2015, the Alabama Legislature passed historic criminal justice reform legislation that greatly reduced the number of inmates in Alabama prisons. Thanks to members of the Legislature, the state’s prison population has decreased from nearly 200 percent of capacity to approximately 160 percent, still too large but an important step in the right direction. Also in 2018, the Legislature helped improve our system by increasing funding for correctional and health services staffing. An additional $86 million was appropriated for the state’s 2018 and 2019 fiscal years to retain new staffing for medical and mental health services and to reduce the turnover rate of correctional staffing. For the upcoming Regular Session, my budget proposal will include an additional $31 million to hire 500 new correctional officers and increase the pay scale for all security personnel to make their salary competitive given current market conditions in Alabama. Alabama currently sits under a federal court order requiring the state to roughly double the number of correctional officers in the next two years. Although I disagree with many aspects of the lawsuit that led to this order, the fact of the matter is that it compels us to make staffing levels a necessary and vital part of the solution to our problem. In December, we saw our first increase in the number of correctional officers in years. With a rising retention rate, we can begin adding to our officer ranks, rather than simply maintaining our current staffing levels. This is a difficult task, but because of the commitment from members of the Legislature, we are now well on our way to addressing our staffing challenges. Next, we must improve the conditions in which we house inmates. “Deplorable”, “horrendous”, and “inadequate” are words which have been used to describe them. Our existing facilities need $750 million in maintenance alone. Last year, we closed the Draper Correctional Facility, a 79-year-old prison, because it was simply too costly to repair. Without costly maintenance, many other facilities may require closing as well. Repairing these facilities that do not meet the needs of today’s criminal justice system would be wasteful and ineffective. We must put aside politics of the past and fix this problem for the betterment of our state. Alabama must have new prison facilities because we must have better conditions, we must have better safety, and we must have better programs. The Department of Corrections hired a project management team that recommended we build three new regional men’s prisons. Of the three new facilities, one will have additional space centralizing services for special needs populations: the aged, the infirmed and those with mental health conditions. Additionally, there will be space in each new facility for educational and vocational training programs. These facilities will be a valuable and lasting investment in the future of our state. On average, 95 percent of our inmates, once they have completed their sentence and are eligible for release, will be returning to the cities, towns, communities and neighborhoods within Alabama. This investment will secure our opportunity to release these individuals back into society as more educated and more productive, law-abiding citizens. The investment in these new facilities will also ensure that we retain control of our correctional system. Across this nation, federal courts are intervening in unprecedented ways into the operations of correctional systems. In 2009, three federal judges ordered the release of thousands of inmates in the California prison system. Some estimate this order resulted in the release of more than 40,000 inmates. Following the release of these inmates, one study into the impact of this mass release called the increases in crime rates “alarming.” So, our public safety also demands this investment. Today, the Department of Corrections is preparing a “request for proposals” for distribution to contractors in Alabama and across the nation, asking for bids to build these new prisons. By taking this step, we will – for the first time – receive the most accurate view of the real cost of building these new facilities. Some opponents of this plan say that it is too costly. Here in Alabama and across our country, we have a set of laws to which every person must adhere. However, no matter what crime was committed, every human being deserves a certain level of care. I say to you that it is and will continue to be costly to provide adequate living conditions and health care for the more than 20,000 adults in our corrections system, to maintain aging facilities, and to sustain public safety. Others say special interests have a hand in this plan; that could not be further from the truth. In fact, I make a promise to you that part of this next step is to publicly provide the real costs we receive from contractors and to work closely with the Legislature to determine the most cost-effective way of moving forward. Whatever we do will be the best and most fiscally responsible decision for the state of Alabama. A tough decision will have to be made in the very near future. With the continued support from the Alabama Legislature and with the added support from the people of Alabama, I am putting forth this plan to make “Trouble in Alabama Prisons” a headline of the past. As we work together, we will solve this problem and make the situation better for those incarcerated, the employees who care for them, and the entire state of Alabama. 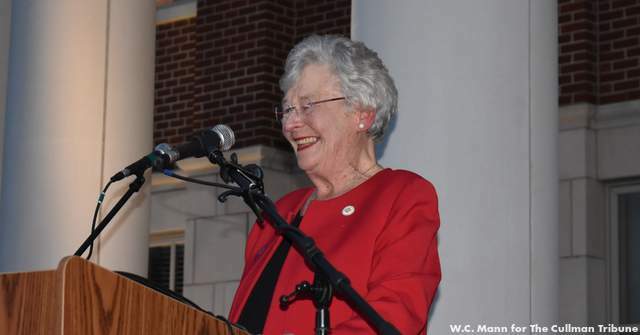 I applaud Governor Kay Ivey for her bold steps to solve Alabama's prison problems! I appreciate her close working relationship with the legislature and I support the plan she has released today. Trust in her integrity, deliberative and methodical planning and her leadership gives me the confidence to support her on this issue. We have to think of the public's safety, inmates' human decency and stay ahead of the courts to solve this problem. It's important that we address what's going on inside the prisons as we work on this problem.